When the European Marine Energy Centre (EMEC) was established by Highlands and Islands Enterprise (HIE) and its funding partners in 2003, it was with the intention of stimulating and accelerating the development of tidal prototype energy generating devices. As part of the Prime Contracting Framework Agreement, Highlands and Islands Enterprise (HIE) engaged Tulloch Prime Contracting Limited (Tulloch) to undertake the design and construction of the tidal test facility. The establishment of a test centre for assessing the performance of new and developing tidal energy technology is a strategically important facility for Scotland and the UK. AURORA Environmental Ltd (AURORA) was contracted by Tulloch to undertake the environmental works for the construction and installation phase of the tidal test facility, including a number of baseline studies and the production of an Environmental Statement (ES) to support consent applications. The scope of the Environmental Impact Assessment (EIA) produced for the test site covers the construction, installation and generic presence of the test site, but does not cover the installation and testing of individual prototype devices. In order to be able to assess the impacts of the long-term presence and operation of the site, it was necessary to consider a range of likely potential devices at a generic level. The detailed consideration of individual devices is the responsibility of each developer making use of the site. To this end, EMEC has developed EIA guidance for potential developers in consultation with a wide range of regulatory organisations and local stakeholders. The lifespan of the project is estimated at 15 years, with individual prototypes being on site for between 6 months and 10 years. Additional devices may be added to each cable in the future, and there is scope to expand the onshore facility within the existing site if required at a later stage. In 2014 EMEC published an Environmental Appraisal of the site to facilitate the consenting process by reviewing environmental information and providing an appraisal to inform developer licence applications for the deployment of devices. The Fall of Warness test site consists of eight berths, each with an 11kv seabed cable to export electricity to the onshore substation.The cables are wet-type composite cables consisting of three EPR-insulated stranded copper power cores designed for alternating current, three 2.5mm2 copper signal/pilot trip cables and a 12-core single-mode fibre-optic bundle. The cable is then armoured with two layers of galvanised steel wire. Cables were provided by AEI (wave test site cables) & Pirelli (tidal test site cables). 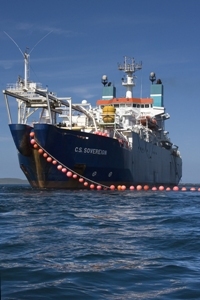 The cables were laid as standard sub-sea cables on the sea bed. As the cables approached the shore, in 15m of water, ductile iron cable protectors were attached. At the low water spring tide mark, each passes into a trench dug 12m into the seabed and beach. Onshore, the cables are fed into a manhole and then into the substation. At the seaward end, each cable, when not occupied by a developer, is terminated using a specially designed connector provided by J+S Ltd, which allows EMEC to carry out planned condition monitoring of any cables not in use by developers. These terminators can, if required, be converted into splices to enable developers to use umbilical cables to attach their devices to the cables. The onshore substation is a single storey building covering an area of 30 x 5.5m. Inside the substation, each cable terminates at an 11kV circuit breaker, along with the tripping cable. The fibres are terminated in the communications area of the substation. The electrical output performance of each of the devices is measured by equipment within the substation and transmitted to the data centre. EMEC then analyse the quality of the electricity to demonstrate that the devices can provide a smooth and reliable supply of electricity to the grid. The metered data is also provided to the developer through the Supervisory Control and Data Acquisition (SCADA) system and the power data is logged in the data historian to be made available for historical trending. We ensure the confidentiality of the data collected. 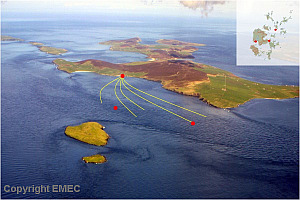 The EMEC Fall of Warness grid-connected tidal test site is situated off the island of Eday where the Atlantic Ocean meets the North Sea, approximately 20km north of Kirkwall in the Orkney Islands, Scotland. The eight test berths on site range in depth from 12m to 50m. Each developer is required to submit device-specific information to support amendment of these consents to allow installation of their device. This information includes a project summary and details on how the specific device details align with the EMEC environmental description and navigational risk assessment. Disturbance/modification to benthic habitats and communities due to cable laying in inshore waters. Pollution of water column from antifoulants, lubricants and hydraulic fluids. Ongoing minor disturbance to seabed communities in the immediate vicinity of the routes where the cable is laid on the seabed. Seabed disturbance/modification during foundation installation and during device installation/removal e.g. anchors etc. Disturbance (noise and physical presence) to local fish, seabird, seal, otter and cetaceans populations as a result of device installation. Loss of water current energy from the marine environment due to presence/operation of test devices may result in sedimentation and habitat and community modification and increased stratification in the water column. Foundations could affect seabed current flow and consequent sedimentary processes. Wildlife entanglement/entrapment and collision with device blades e.g. diving bird populations, cetaceans (in particular the harbour porpoise), seals (in particular pups)and otters present in the area. Disturbance/modification to benthic habitats and communities as a result of cable-laying in inshore waters. Developers are not required to undertake a baseline seabed survey as this was carried out as part of the ES. They are however required to undertake a seabed survey post-decommissioning to assess the effect of the device upon the seabed. Other commitments are defined in the Guidance for Developers Document. EMEC has been involved with a number of other research institutions to identify the knowledge gaps and initiate research aimed at addressing these. EMEC Fall of Warness Grid-Connected Tidal Test Site is located in United Kingdom. The following field surveys were undertaken (or commissioned by) the developer to inform baseline characterisation. Flora and fauna survey near landfall site. The fauna present represent those commonly found on rocky shores with patches between the algal turf colonised by barnacles and limpets. More exposed area supported dog whelks, periwinkles, shore crab and starfish. Swathe bathymetry of the tidal test site. The bedrock is exposed throughout the majority of the test bay area, with occasional boulders. The swathe bathymetry shows that the bedrock forms a series of ridges. Preliminary seabed survey (Aquatera Ltd) and Additional seabed survey (SULA Diving). Video and still photography data collected by divers and ROV. Survey area was selected to cover the areas where the cables would be laid, the location of the tidal devices, and to obtain a general picture of the seabed habitats in the area. Due to unfavorable weather conditions surveying in the exact locations preferred became difficult and divers were moved off course by the strong tidal stream in the area. The majority of areas that had been proposed as seabed survey stations were videoed/photographed and are considered to be representative of the wider habitats of the project area. It appeared from the survey that there are no species of importance in the area, with no unusual species being recorded. Characterize the species present in the area of the test facility including the south west coast of Eday and the Green Holms. The coastline between the east end of the Bay of Greentoft and the west end of Sealskerry Bay provides shelter, nesting sites and feeding sites for a large variety of bird species. Survey the use of the area by otters. It is likely that otters occur all-round the coastline of Eday and Faray, however no occupied holts were found in the survey. Evidence of otter presence was found at a number of sites along the six kilometres of coast surveyed. Harbour porpoise use the area for passage between Westray and Stronsay Firths and for feeding. Occasional sightings of Minke and pilot whales were made. Unidentified dolphins were also reported on several occasions, between the months of May and August. Telemetry data to characterize the use of the area by seals making use of nearby haul out sites. From the available data, there were no major movements of common seals through the Fall of Warness. Seals did use the haul-out sites on The Graand and the Green Holms. These tracks were from seals tagged at haul-out sites some distance from the test site. The pattern of use of the Fall of Warness by grey seals is unclear. Muckle Green Holm and Little Green Holm appear to be important haul-out and breeding sites and there has been some use of the waters to the south and west of Eday. However, as with common seals, none of the grey seals were tagged in the vicinity of test site as part of the survey and this might be reflected in the pattern of use. During the period 1 April 2013 to 31st March 2014 a total of 909 hours of observations were completed. Seasonal peaks in grey and harbour seal abundances corresponding with pupping seasons were observed. The majority of cetacean sightings during this reporting period have been white-beaked dolphins, whereas typically the most sighted cetacean is harbour porpoise. A typically diverse range of marine birds has also been observed, although for several species numbers in April and May 2013 fell below the mean.